Diggin' to China: Mazel Tov! Zooey Deschanel And Ben Gibbard! Mazel Tov! Zooey Deschanel And Ben Gibbard! 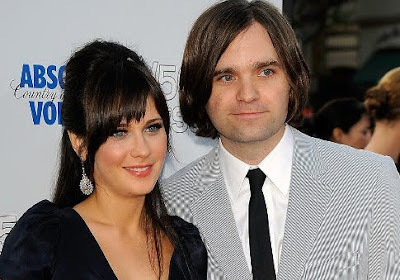 Death Cab for Cutie front man Ben Gibbard married his longtime sweetheart actress/musician Zooey Deschanel on Saturday! Mazel Tov kids . psssssst Zooey pressure your hubby for a new Postal Service album -seriously we're tired of waiting! I'm hoping that they'll procreate and bring the ultimate-super-indie-kid into existence...I'm picturing one that will crush your mind with his/her brand of melancholy and grammatically correct lyrics while burning your eyes out with his/her intentionally unintentional use of the plaid shirt.